Shouldn't anarchism be far-right, since right-wing politics opposes "big government" and favours less government influence? Anarchism has basically no government influence, so shouldn't it be the most radical viewpoint on the right? Anarchism is traditionally viewed as far-left, but it doesn't make much sense, since left-wing politics supposedly favours "big government" influence. No, because there are different dimensions. There is authoritarianism/anti-authoritarianism, versus liberal/conservative. Here are several charts which shows the possible outlays expanding on the limited left/right paradigm. This is a Nolan Chart. 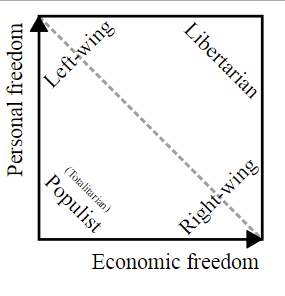 It uses the axis of personal freedom vs. economic freedom. Left anarchists don't believe in economic freedom. If someone tried to price gouge, they would be visited with violence. 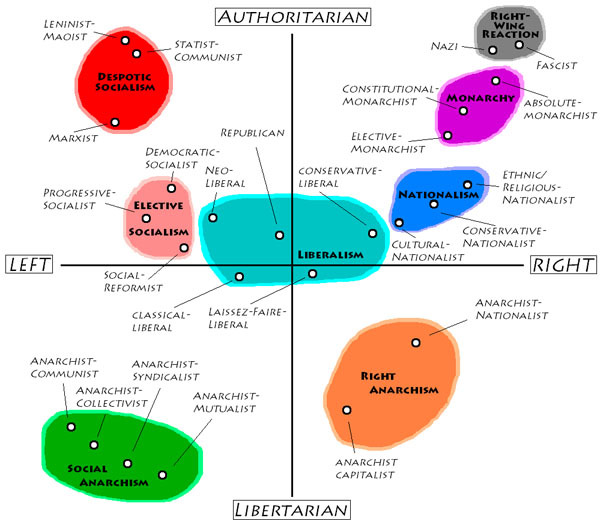 This chart shows authoritarianism vs. left/right. I might disagree with some of the positions of the dots. First of all, left and right are arbitrary definitions. You have to remember that it originated in the physical position within a parliament. Nevertheless in each country at any moment, a left-to-right scale is established to separate liberal-oriented from conservative-oriented. Whatever that means in the given country. But politics isn't one-dimensional and the extreme cases break that model even more. But just to focus more on them, while the more centred right often promote a minimal state for a maximum freedom for companies and economy. However when travelling towards the extreme, you find more conservative, who also like the state to have a minimum influence on the economy, but often like the state to protect the people (police, army, justice, etc.) as well as promote certain values (family, tradition, etc.). And if you get much more on the extreme, you get to fascists states. Which would be hard to argue that they promote a minimal central government. Anarchists is to some extend the communism without representation. They don't believe in economic liberalism. And like to have a control of the economy by the government. With the exception that the government is composed of all the citizens. So as a more extreme case of communism, it is usually placed on the left. Here is a nice explanation. There is a quiz if you want to take also. In short it displays anarchism (lower end) and authoritarianism (higher end) as the extremes of another (vertical) axis as a social measure while left-right is the horizontal axis which is an economic measure. My analysis is: Anarchism is about self-governance, having as little hierarchy as possible. As you go to the left, the means of production are distrubuted more equally; and as you go to the right, individuals and corporations own more of the means of production and accumulate capital. On the upper left you have an authoritarian state, distributing the means of production to the people as equally as possible; on the lower left you have the collectives, getting together voluntarily utilizing their local means of production and sharing the products; on the lower right you have anarchocapitalists, with no state, tax or public service, everything operated by private companies in a completely free and global market; and finally on the top right you both have powerful state and corporations (pretty much all the countries). But after all, these terms change meanings through history and different cultures. I personally think that under unrestrained capitalism the accumulation of wealth both creates monopolies and more importantly political influence. So that influences state interference and civil liberties also. It also aspires for infinite growth which leads to the depletion of natural resources which is another diminishing fact for the quality of living for the people. At that point it favors conservatism rather than progressive scientific thinking. I do believe under collective anarchism, since it's localized, it is quite difficult to create global catastrophes, and I think this is why in today's world, the terms anarchism and capitalism seems as opposite. Sorry for the biased analysis. Historically speaking there have been some far right anarchist groups. Perhaps most notably the Christian anarchists, although it's easy to argue degrees of left or right in each of individual movements in the category. There are also National-Anarchists, who seem to support racial and ethnic separation, while also opposing Marxism, capitalism, and government control. With these examples​ in mind I would like to suggest that "anarchism" is a fairly broad political ideology, meaning that anarchists desire to abolish the state and government control, but reasons for this desire vary wildly between individual anarchists and movements. Taking that conclusion a step further... It becomes fairly easy to see why there are so many distinct anarchist movements and why unity between movements has proved difficult. There is government, and there are companies. Especially big companies. Big companies have power to suppress the citizens. The bigger the company, and the weaker the government, the more the big companies can suppress the citizens. Anarchy is against suppressing citizens. Not as their main statement, but they are against government mostly as the citizen suppressor, so they will also be against big companies suppressing people. Right-wing politics is often against big government with the express purpose to give more control to companies, and less oversight. The biggest lie, the left has been promoting is that Nazism and Fascism are left wing. The further left one goes we move into totalitarianism with 100% government. Quite the contrary though when we move further right. We are somehow supposed to believe that somewhere at the extreme left, total freedom arises from complete control by government and likewise total control by government happens within total freedom - anarchy. Anarchy is, always has been and always will be 100% right wing, in fact extreme right wing. It's just that the word's meaning has been muddied to hide what our dear leaders don't want us to see. We're all conditioned to think of "anarchy" as "chaos". Then we've got a bunch of shills/posers claiming they're "Anarchists" while spouting ~Marxist nonsense. You can just keep it simple and take Anarchism to mean not having rulers. That's where the word is rooted anyway. Note that even though we're not ruled by Kings and Emperors anymore, we do still have rulers. Now we have something like co-rulers - whatever bunch of psychopaths happen to call the shots from behind the scenes, and to a smaller extent, the Parliament or House of Poncey Stooges With Wigs or whatever. But in a nutshell, all it takes for anyone to be an Anarchist is understanding that no one is "more equal" than anyone else, and that includes our "leaders" (=rulers). They don't have the moral right to impose their will on you, or anyone else. But they do it anyway, and that's wrong. Give me your lunch money, or I'll punch you! Give us 30% of your income, or we'll imprison you! Not the answer you're looking for? Browse other questions tagged ideology anarchism political-spectrum or ask your own question. What's the cause of the general rightward shift in western politics over the last 30 years? What are the reasons behind the recent resurgence of far-right politics?